Nowadays, most images captured, have high resolutions. Yes, they look great. But sometimes, our requirements are something worse. For example, at the time of form fill up, or sending images as an attachment. But how to resize photos in Windows 10? Is it a complicated process? Well, It depends. You can find numerous jpg image resizer software free download options. Each of them offers a similar set of functionalities. But as the task is simple, you should go for a simple software as well. If you know how to resize a photo in paint, you know how complex it is. Not complex. But it is time-taking. Here I will be discussing the easiest way to resize a photo on a computer. And it will be the simplest one, you can find. I will be discussing a one-click image resizing method. 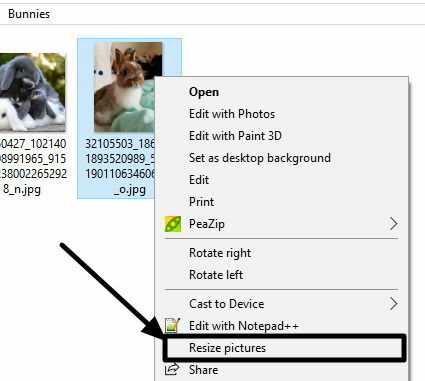 So, here is how to resize photos in windows 10, 8 and 7. Step 1: Just download Image Resizer for Windows 3.3 from this link. It is just a small program having a size of 900 KB. It can reduce the file size of a jpeg and other image file formats. Step 2: Install it. The installation is similar to installing other programs on Windows. The program does not come with packed malware. Your task is complete. It is an Imager resizer for Windows 7 64 bit. Though it even functions without any problem on 32 bit systems. With the help of this program, you can even resize multiple photos on Windows 10. However, according to the software technical specifications, it mentioned that this can support all Windows platforms such as Windows 2000 / XP / Vista / Windows 7 / XP 64-bit / Vista 64-bit / Windows 7 64-bit / Windows 8 / Windows 8 64-bit / Windows 10 / Windows 10 64-bit. Step 1: Now let’s find out how to use it. Step 2: Just right-click on an image, and click on ‘Resize pictures’. Step 3: You can even choose multiple images to use it as a resize multiple images software. Choose ‘Resize pictures’ in that case, as well. Step 4: After that, a small program will open. Just like the one here. Step 5: Now you will find multiple options. There are some pre-defined settings. They are ‘Small’, ‘Medium’, ‘Large’, and many more. You can choose any one of them to choose a pre-defined custom resolution. You can even choose your own custom resolution to the desired value. You can scale it to any value. Just choose the appropriate radio buttons for the options you need. You can even shrink the picture size, and overwrite the originals. Just select the options you need. Done setting the options! 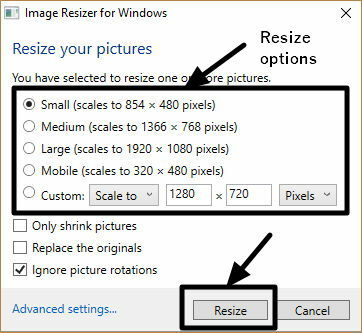 Click on ‘Resize’ to get the output with the desired image resolution. It is a great tool indeed. It is the best image resizer for Windows. It can be used as a quick image resizer for everyday tasks. 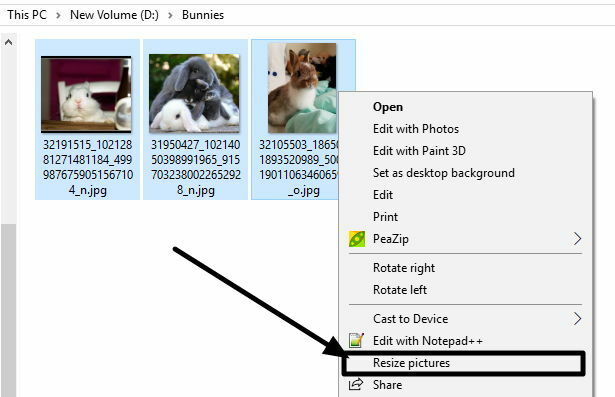 You can resize multiple images Windows 10 for the purpose of giving finishing tasks to your works. Hope the small information on resizing images with a single click, was helpful for you. What do you think about this tool? Let me know about it in the comment section down below. Thanks for this info. Really really helpful. Thanks for your support. This is really handy.